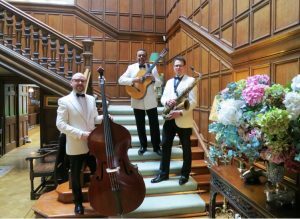 The Ritz trio plays jazz ,swing, latin and modern for weddings, parties, receptions and corporate events. If you are looking for something slightly different with a sophisticated edge then the Ritz Trio jazz band could be just what you are looking for. Lively continental style jazz, classic jazz swing and even the odd more popular tune, will help to create a fun, foot tapping atmosphere. And don’t worry about it being too loud, the Ritz Trio specialise in providing background music all played at a level to enable your guests to enjoy each others company without being too loud. The Trio have been providing first class wedding entertainment in Scotland and further afield for over a decade now! The music is a mixture of Jazz, Swing and Latin with a repertoire ranging from dinner and cocktail classics such as “The Girl from Ipanema” and “Take Five”, to the more modern end of the spectrum. The Trio are able to tune the mood substantially for your wedding or event, blending into the background during the reception so that guests can mingle and talk, or cooking up a little more energy later if required. 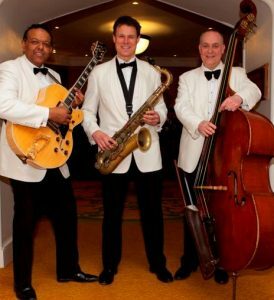 The Ritz Trio is the resident band on the Royal Yacht Britannia and are accustomed to playing at other prestigious venues including Skibo Castle, The Old Course Hotel, Gleneagles, Hopetoun House and Rufflets. The reputation this jazz band have earned over many years has seen them working with some of the world’s leading companies. From the moment you make contact with The Ritz Trio you can be assured that planning the music for your corporate event in Scotland will be a trouble free experience. You can relax and look forward to the day when we create an unforgettable atmosphere for your clients. The band can also be increased to a six piece by adding keyboards, drums and another brass instrument. The group also play as part of a larger nine piece big band.